On February 27, 1860, 1,500 people paid two bits apiece to hear a former one-term Illinois Congressman give a speech that would propel him to the Presidency of the United States. On February 25, 2010, The Cooper Union paid tribute to Abraham Lincoln and that speech in the same Great Hall in which he originally delivered it. To celebrate the 150th anniversary of Lincoln’s “Right Makes Might” speech and to formally close The Cooper Union’s 150th anniversary year, the Department of Public Programs produced the eighth and final Great Evening in The Great Hall. The series of Great Evenings (which began in April 2009) commemorated The Great Hall’s role as a platform for abolition and civil rights, electoral politics, workers’ rights, science and technology, women’s suffrage, art and literature, and radical politics. On this last of the evenings, Lincoln’s oratory was recreated by a cast of distinguished actors and statesmen. Historian Harold Holzer, author of (among many other books on Lincoln) Lincoln at The Cooper Union, introduced the evening by outlining the events that led up to Lincoln’s journey east to address New York members of the Republican Party. The 2010 speech was divided into six sections with interludes of music between them. Actors Kathleen Chalfant (Tony Award-nominee and Obie Award-winner,) Andre DeShields (star of The Wiz and many other plays,) Academy Award–winner Richard Dreyfuss and Stephen Lang (most recently in Avatar) each read a section. Frank Williams, retired Chief Judge of the Rhode Island Supreme Court and noted Lincoln scholar, and Governor Mario Cuomo also read sections. The result of this rich variety of voices—male and female, black and white—was an utterly new version of an occasion that made history in The Great Hall. Unlike the original event, Cooper’s recreation included a chorus singing campaign songs of the 1860 election and Spirituals that Lincoln was known to love. 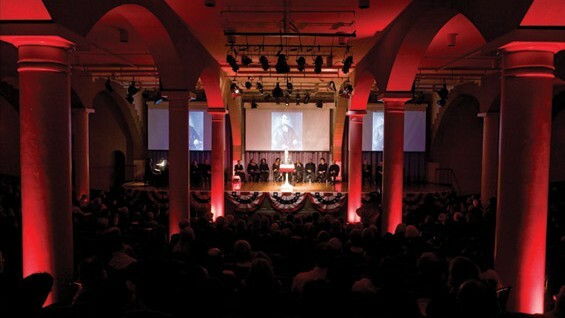 Projections, dramatic lighting and a panoply of patriotic bunting added a feeling of an authentic 19th century campaign rally.